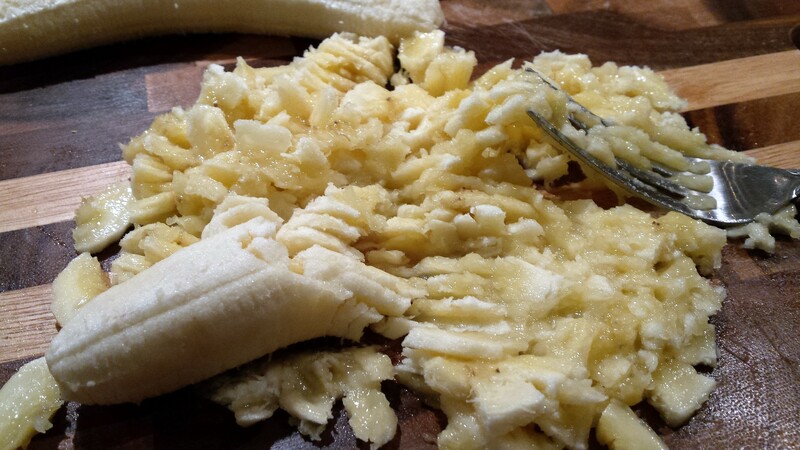 Let’s go Bananas today as I gear myself up to sharing one of my childhood recipes. Bananas are a much loved fruit, full of energy to boost up the day – eaten on its own, chopped and mixed in breakfast, baking and so much more that can be done with this energy booster fruit. 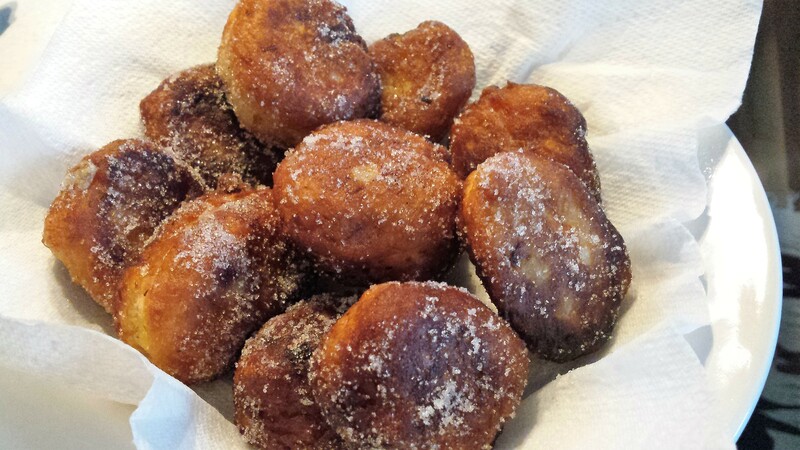 Wait until you see what I have added with these banana fritters……that will make you want to have them for breakfast. 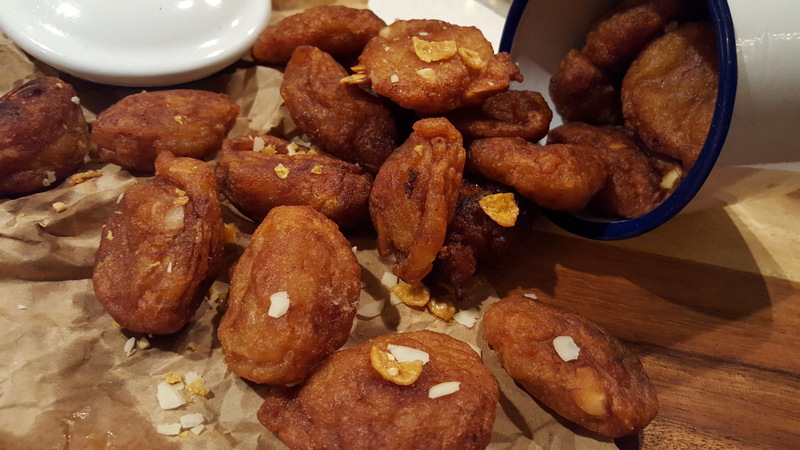 I am a big fan of banana fritters, these fritters are such a popular day time snack in Mauritius. 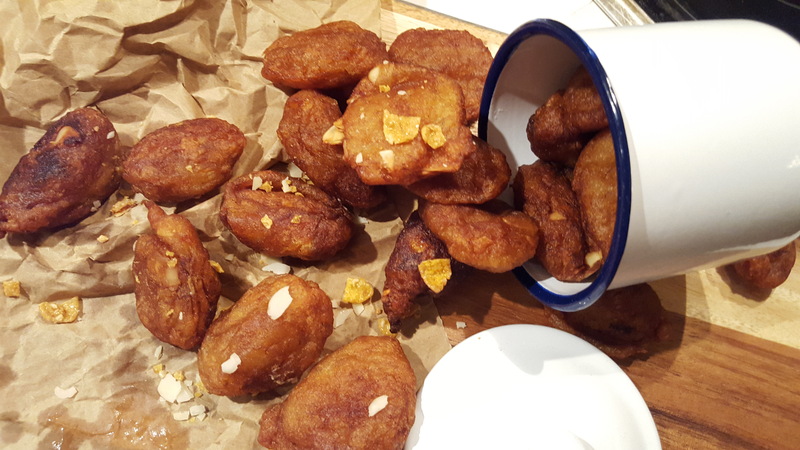 They are made on any occasion, every day is a special day as we want to be – and when it comes to making banana fritters you don’t need to look too far but your fruit basket. Since I was little I have always liked banana fritters, mum used to make these often for us, we were never disappointed coming back from school and almost every day have a little treat to accompany our mid-afternoon tea breaks. I am sure many of you must already be familiar with this recipe. Don’t freak out when you see this picture. These battered fruits look so sad, but trust me they won’t be once I get my hand on them. What would you do with fruits looking like these? – please don’t tell me you would put them in the bin……that would be too sad. Not when you can turn them into these gorgeous plump looking goodies. Simply because these look bruised does not mean they are not good to eat, why waste when you can taste. I am always playing around in the kitchen and this time I decided to add some pears in my banana fritters. I get inspirations to try out new recipes when I look around in my kitchen, and since I intended to make these for my breakfast I decided to add another unusual ingredient to this batter. Crunchy nut cornflakes and flaked almonds. Ever so pleased with the results, it gives more dimension and texture to these fritters and I do like a crunch. To wrap up the recipe trial in one word – awesome. So before this was forgotten I decided to write the recipe up quickly as it’s definitely one to save in my recipe folder. For the traditional version omit the pear (but add more banana), cornflakes and flaked almond. On these ones you can finish off with a sprinkle of cinnamon sugar or simple eat the just as they are. Hope you will try both my crunchy banana fritter and my coconut banana fritter with cinnamon sugar. Perfect to share with friends and family and enjoyed with a lovely cup of tea. In a large bowl, stir together the mashed banana, pears, flour, sugar, baking powder, cardamom and mix to a thick batter. Taste for sweetness and adjust as needed. Crunch up the cornflakes, almond and coconut in the batter. Using a spoon gently fold everything into the batter. Place a heavy deep pan with enough oil to start deep frying. Using a spoon, gently spoon into the hot fry oil. Using a long handled spoon flip the fritters around until they are a nice golden-brown, approximately 2 to 3 minutes. Remove with a slotted spoon to shake off excess oil and place on a paper towel to cool down. Repeat the process with the remaining batch of batter until all is done. Brinda’s Note: Its egg free therefore makes a good vegetarian little bite. As I don’t add any milk or butter to the batter they are good for vegan lovers.